Editor’s update: At this time, we’ve had to put the AV1 implementation in Firefox behind a Mozilla preference (pref). We are currently working to address an issue that will allow us to turn AV1 back on by default for everyone. In the meantime, you can still try the demo linked in this blog post. You’ll need to open about:config in Firefox Nightly and manually switch the setting media.av1.enabled to true. Bitmovin and Mozilla, both members of the Alliance for Open Media (AOM), are partnering to bring AV1 playback with HTML5 to Firefox as the first browser to play AV1 MPEG-DASH/HLS streams. While the AV1 bitstream is still being finalized, the industry is gearing for fast adoption of the new codec, which promises to be 25-35% more efficient than VP9 and H.265/HEVC. 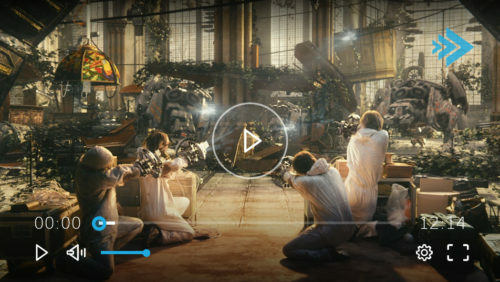 A test page has been prepared to demonstrate playback of MPEG-DASH test assets encoded in AV1 by the Bitmovin Encoder and played with the Bitmovin HTML5 Player (7.3.0-b7) in the Firefox Nightly browser. AV1 DASH playback demo by Bitmovin and Firefox Nightly. Short film “Tears of Steel” cc-by Blender Foundation. Visit the demo page at https://demo.bitmovin.com/public/firefox/av1/. You can download Firefox Nightly here to view it. 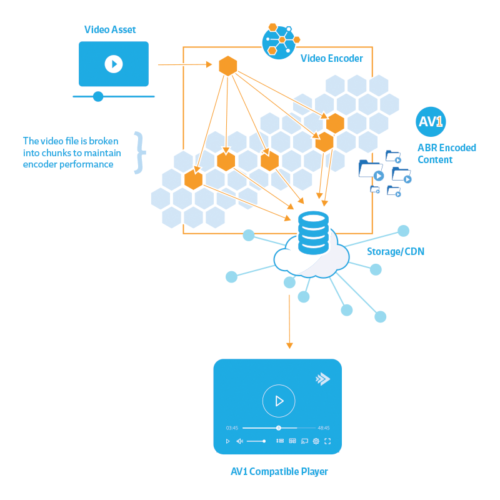 The Bitmovin AV1 encoder is based on the AOM specification and scaled on Bitmovin’s cloud native architecture for faster throughput. Earlier this year, the team wrote about the world’s first AV1 livestream at broadcast quality, which was demoed during NAB 2017 and brought the company the Best of NAB 2017 Award from Streaming Media. The current state of the AV1 encoder is still far away from delivering reasonable encoding times without extensive tuning to the code base: e.g. it takes about 150 seconds on an off-the-shelf desktop computer to encode one second of video. For this reason, Bitmovin’s ability to provide complete ABR test assets (multiple qualities and resolutions) of high quality in reasonable times was extremely useful for testing of the MPEG-DASH/HLS playback of AV1 in Firefox. (HLS playback of AV1 is not officially supported by Apple, but technically possible of course.) The fast encoding throughput can be achieved thanks to Bitmovin’s flexible cloud native architecture, which allows massive horizontal scaling of a single VoD asset to multiple nodes, as depicted in the following figure. An additional benefit of the scalable architecture is that quality doesn’t need to be compromised for speed, as is often the case with a typical encoding setup. We used the royalty-free Opus audio codec and encoded with 32 kbps, which provides for a reasonable quality audio stream. Firefox has a long history of pioneering open compression technology for audio and video. We added support for the royalty-free Theora video codec a decade ago in our initial implementation of HTML5 video. WebM support followed a few years later. More recently, we were the first browser to support VP9, Opus, and FLAC in the popular MP4 container. After the success of the Opus audio codec, our research arm has been investing heavily in a next-generation royalty-free video codec. Mozilla’s Daala project has been a test bed for new ideas, approaching video compression in a totally new way. And we’ve been contributing those ideas to the AV1 codec at the IETF and the Alliance for Open Media. AV1 is a new video compression standard, developed by many contributors through the IETF standards process. This kind of collaboration was part of what made Opus so successful, with contributions from several organizations and open engineering discussions producing a design that was better than the sum of its parts. While Opus was adopted as a mandatory format for the WebRTC wire protocol, we don’t have a similar mandate for a video codec. Both the royalty-free VP8 and the non-free H.264 codecs are considered part of the baseline. Consensus was blocked on the one side by the desire for a freely-implementable spec and on the other for hardware-supported video compression, which VP8 didn’t have at the time. Major hardware vendors have been involved with AV1 from the start, which we expect will result in accelerated support being available much sooner. In April, Bitmovin demonstrated the first live stream using the new AV1 compression technology. In June, Bitmovin and Mozilla worked together to demonstrate the first playback of AV1 video in a web page, using Bitmovin’s adaptive bitrate video technology. The demo is available now and works with Firefox Nightly. Then select an alternate resource or display an error if your encoded resource isn’t supported in that particular browser. Past commit ids we’ve supported are aadbb0251996 and f5bdeac22930.The currently-supported commit id, built with default configure options, is available here. Once the bitstream is stable we will drop this convention and you can just test for codecs=av1 like any other format. Since the initial demo, we’ve continued to develop AV1, providing feedback from real-world application testing and periodically updating the version we support to take advantage of ongoing improvements. The compression efficiency continues to improve. We hope to stabilize the new format next year and begin deployment across the internet of this exciting new format for video. Ralph has contributed to media technology and royalty-free codecs for most of his career. Currently he helps maintain the video playback module in Firefox and supports new work in the Rust programming language. In his spare time he enjoys books and early music. Martin is responsible for Bitmovin Encoding product strategy, roadmap and development. His team works to enable complex video encoding workflows for global premium media and technology companies like Red Bull Media House and the New York Times. As one of the first employees, Martin led the development of Bitmovin encoding infrastructure, building the world's first commercial massively scalable encoding service, capable of achieving 100x speeds over realtime. Currently, Martin oversees further development of the Bitmovin Encoding solution, including integration of new technologies, like AV1. Testing it on Nightly on an i7 920 @2.67 GHz (4 cores with hyperthreading), and starting around 4 minutes in, there were sporadic stalls. Towards the end, and particularly in the credits, it was stalling every few seconds. It seems to run varying streams, and it capped out with 720p @ 800 kbps (which was pretty nice quality). How is the decoder built? Is it intended to use Rust, for a more reliable multithreaded version? Thanks for the feedback. Dropping frames is unfortunate, but not entirely unexpected. We’re using the reference decoder which is in C and not very optimized. I expect it will get a lot faster next year. We do request multi-threaded decoding, but each video frame has to be partitioned for that to help and that’s less helpful at lower resolutions. The streams in this demo aren’t partitioned that way. I’d love to have a Rust decoder and I hope someone writes one. The best time for that is after the spec is finalized though, so the effort can also act as a review on the format description, though. Great article and very good news. You might want to replace the quote marks with apostrophes in the last code snippet. I’ve un-smart-quoted the code example. Thanks for pointing out the bug! article needs updating, av1 will be ratified in january, not end of 2017. Thanks for the correction. I’ve bumped the date in the article. VP9 is currently disabled by default in Firefox 57 and 58 beta on macOS. Will AV1 also be disabled by default on macOS when it rolls out to a release version of Firefox? I don’t know how long to expect this demo to work, what with the commit IDs having to match perfectly, but just wanted to mention the demo is not working, right at this moment. Whoops I was wrong. The demo is still working. I was testing on a Linux Mint liveCD, with no multimedia codecs installed. Once I installed ‘mint-meta-codecs’, the AV1 demo worked. So at least on Linux, you need to be able to play other HTML5 videos besides the demo, or it won’t work.